Mowry Baden is an artist who has works all over North America. 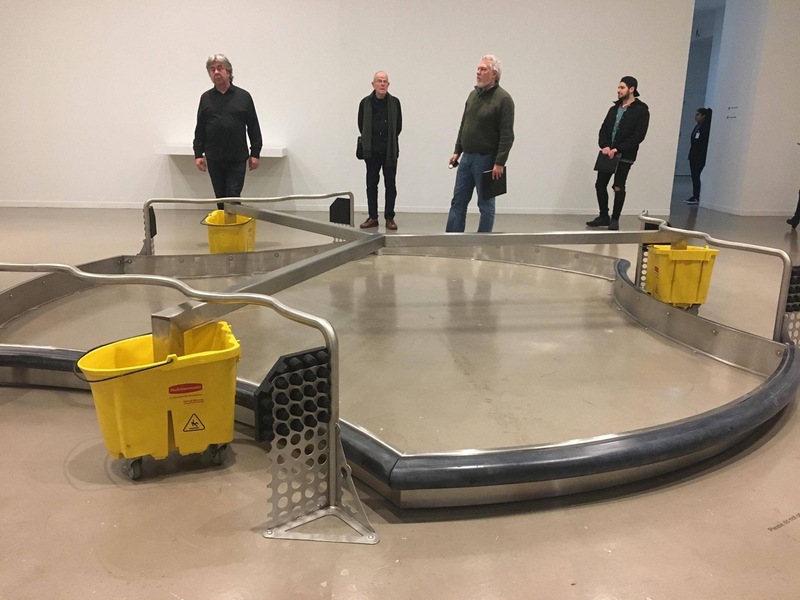 On March 14, the Other Press attended a media tour at the Vancouver Art Gallery, hosted by Grant Arnold, Audain Curator of British Columbia Art, and Baden himself. The tour alternated in discussing the art pieces as well as Baden’s personal and artistic life. Arnold began the tour with a brief summary of Baden’s early career as an aspiring artist. Baden is an important West Coast figure. He has taught at UBC and UVic, and even has a public art piece displayed outside BC Place. Arnold noted that Baden wanted to be a writer but became an artist instead. He creates innovative sculptures that are heavily inspired by his own imagination. He is also influenced greatly by perceptual psychology, science, and architecture, which his son studies. Throughout the tour, Baden asked us to think deeply about each work at hand. He said, “When we see somebody doing something, we mentally do it ourselves.” He suggested that each interactive sculpture is not what it seems, and to know it, we must experience it for ourselves. The interactive displays were interesting enough to look at even before experiencing them. There is a metal rod protruding from the ground with a seatbelt attached at the end. You must put on the seatbelt, then walk around the centre of the display and feel how you walk. It is meant to give the user insight to how their physical body really moves. Cheap Sleeps Columbine (1994) is an exceptionally breathtaking piece. It is constructed with the cheapest mattresses (with the biggest flowers) that Baden could find. It is an enclosure meant to recreate a gazebo-type feeling. 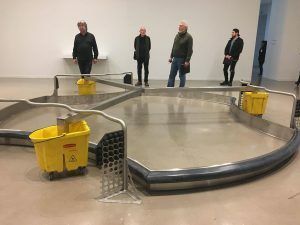 It is a “work that shields the viewer from the world,” Baden said, emphasizing the associations that come with a bed, such as safety, healing, and passion. Ukulele (2011) is another enclosure piece and the largest in the exhibition. You walk through a short tunnel into a dark, one-person room. In this room there are black walls covered in white dots representing stars, colourful flashing lights, and ping pong balls flying towards you. The physical composition of the work is meant to make the viewer feel as though they are in space, with stars and asteroids flying towards them. The ping pong balls give the viewer a bit of natural anxiety as well. Baden said that the piece is titled Ukulele because as a kid he had a ukulele and the sound of the ping pong balls reminded him of the instrument. Humour aside, Baden’s artwork is stunning, relatable, and interactive. The sounds and physical demands of the pieces bring back fond memories of childhood while connecting them to present adulthood. The Vancouver Art Gallery currently has the Mowry Baden exhibition on display from March 9 to June 9.